Glowing skin and hair starts from within. Nutritionist and beauty expert Kimberly Snyder is famous for transforming some of hollywood's hottest celebrities by following her Beauty Detox Diet and incorporating her Glowing Green Smoothies for beautiful glowing skin, hair and weightloss. Drinking the Glowing Green Smoothie, or (GGS), as Kimberly calls it, is a great way to incorporate a tremendous amount of greens into your diet and cleanse your system of toxic sludge which causes early ageing, weight gain and a myriad of health problems she discusses in her book, The Beauty Detox Solution. The Glowing Green Smoothie is the drink Kimberly Snyder drinks everyday and shares with all of her clients which includes some of the top celebrities, to look and feel their best! 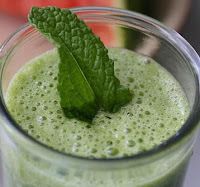 Her clients swear by this smoothie for glowing skin, hair and helping them to loose and keep off those unwanted pounds. She usually recommend starting out with making a GGS of 16 ounces, then working up to 24 ounces or more. Unlike juice, the Glowing Green Smoothie will keep in your refrigerator, as long as it’s covered, for about two and a half days. You can share it with your family or friends, or have it yourself over that time period. You can also freeze portion sizes of it in glass containers and thaw out the night before in a bind. Kimberly highly recommends using a Vitamix blender to make this smoothie, so that it’s smooth, silky, and delicious in only a few minutes of prep time and clean up. Believe me you want a good blender to chop up the fruit and greens properly. Ongoing cleansing is a critical way to reach your highest potential of health and beauty. Fiber is critical for ongoing cleansing by sweeping out toxins on a regular basis, helping to keep your digestive tract and body clean, and also keeping you more full so that you tent to eat less heavier and/or acidic foods throughout the day. Note: She encourages mixing and matching greens and fruit. Vary this recipe with kale, chard, arugula, and the like. You'll want to avoid melons, as they don’t combine well with other produce. Add water, spinach and chopped romaine to the blender. Starting the blender on a low speed; mix until smooth. Gradually move to higher speeds and add the herbs, celery, pear, and apple. Add the banana and lemon juice last. Tip: For 1 serving, cut out one of the fruits and the celery. Remember, your overall diet and lifestyle, and how you are cleansing out waste regularly are critical to getting the results you want! You can’t just drink the GGS and expect maximum results. Be sure to read The Beauty Detox Solution to learn the entire program. It includes the crucial information to understand how to eat for beauty, as well as recipes, meal plans, and much more. Be sure to check out her website for more information and sign up for her newsletter. I want to start drinking a completely green, vegan smoothie for breakfast because I've heard that its really good for you. So what kind of ingredients should I use that are the best for me? The information you have submitted is quite good and informative.